While walking down the river you can enjoy the view of modern Yekaterinburg. 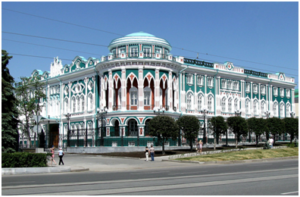 The starting point can be the house of merchant Sevastyanov, situated in Prospekt Lenina 35, Yekaterinburg (on the picture below). From here you can navigate to the central square named Square of Year 1905 or to the Cathedral on the Blood. Be the first to comment on "Walking down the river"